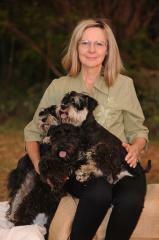 The miniature schnauzer was developed by downsizing the standard schnauzer. Schnauzers have wiry coats. Their beard and long eyebrows need a little trimming. The miniature schnauzer's body has a square appearance when viewed from the side. Lynn Nel 048 886 0638, Cell 083 655 8072, email lnel@R63.co.za webpage: Lynville. 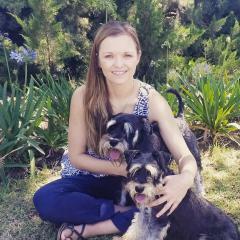 Sandra Raubenheimer 0828371724. email sandraraubenheimer@yahoo.com, webpage: Sanrau Kennels. The miniature has the same characteristics as the giant schnauzer, and makes a feisty burglar alarm in a small package. The most common colours are black, grey and white, salt and pepper. Height at shoulder: males 36 cms, females 33 cms.